Super Sensitivity and Low Noise Mini Shape Audio Pickup and Monitor Device. Can be compatible with not only Dericam Sx and Bx series outdoor camera, but also with other brand's security IP camera. Monitor Range: Around 150 square meters. 【3.5mm Audio In Interface】3.5mm Audio connector for audio in cable port. 【Super Sensitive But Mini】Super sensitive but mini device can be used for Dericam Sx and Bx series outdoor camera to pickup audio. 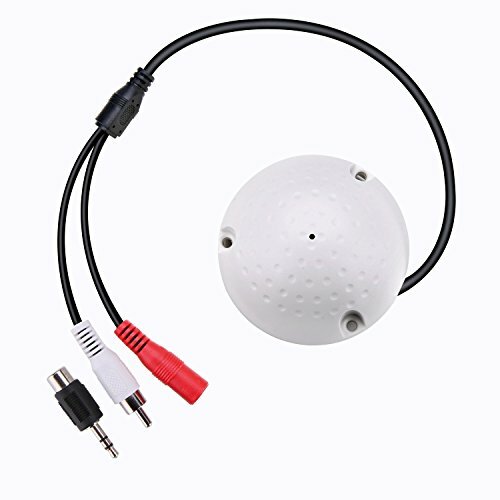 【Extensive Compatibility】 A universal microphone and audio pickup device, can be compatible with other brand's security IP camera which is not the RCA audio interface. 【Compatible With RCA】Not the RCA interface, can be compatible with the RCA interface to support analog CCTV camera or DVR by removing the RCA converter in the front. 【DC Power Splitter Cable】Need a additional 12V 0.5A (or more than 0.5A) DC power adapter to power up, or share the same adapter with Dericam Sx or Bx camera through a 1 Female to 2 Male 12V DC Power Splitter Cable. If you have any questions about this product by Dericam, contact us by completing and submitting the form below. If you are looking for a specif part number, please include it with your message.